You can create different groups depending on your role. Open membership: Any user of the site can become a member simply by visiting your group page and clicking the Join button. Request membership Any user can request to join your group. However, as owner you can choose to accept or decline this request. The requesting member will be notified of your decision automatically. You can add users directly to your group. The members cannot leave this group. You can assign tutors to the group. They can give feedback on submitted pages, but not administer group members. Group members can submit portfolio pages or collections for feedback / assessment. These pages are locked until released by a group administrator or tutor. The site administrator can limit the creation of groups to users with staff and / or administrator rights. If you cannot create a group, you will most likely not have the appropriate permission and will have to contact your site administrator, e.g. via the Contact us form, to enquire about the process of having a group set up. If you are allowed to create a group, you see the Create group button on the “My groups” overview page. Group name: Provide a name for your group. This field is mandatory. The group name that you choose does not have to be unique. Other groups can have the same name. In order to distinguish them more easily, you can add a group description. Group description: Briefly describe what your group is about. Group homepage URL: You can choose what human-readable URL your group should have. You see this field only once you have created your group. A name is chosen automatically, but you can change it. This option is only available if the site allows clean URLs. Open: Switch this option to “Yes” if you want to create an open membership group. This allows users to join the group without approval from group administrators. Request: Set this option to “Yes” if you wish to create a request membership group. Users will have to send a membership request that requires group administrator approval. Friend invitations: Switch to “Yes” if you want to allow group members to invite friends to join the group. Regardless of this setting, group administrators can always send invitations to anyone. If the friends accept, they will be added automatically to the group. Recommendations: Set this option to “Yes” if you want to allow group members to send their friends a recommendation for joining this group from a button on the group homepage. If a request membership group has been recommended and the friends are interested in it, they would still need the approval of the group administrator to join. Publicly viewable group: Set this option to “Yes” if everybody shall have access to content of this group. You only see this setting if the site administrator allowed you to have it. Anybody online can see the group homepage and the discussion forum(s). Depending on the membership visibility, they may also see group members. Only members of the group can see the group’s pages, unless they have been made public, and the files area. Participation report: Switch this option to “Yes” if you as group administrator want to view a report displaying all group pages and those that have been shared with the group and see who commented on them. Start date: As group administrator you can decide when regular group members shall be able to create and edit content, forum discussions, pages and collections in the group. Tick the checkbox to enter a date and time from when editing is allowed. End date: You can allow the editing of group content for regular members up to a certain time. After that they will only be able to view forum discussions, pages, collections and files, but not edit them. Tick the checkbox to enter a date and time until when editing is allowed. The page owner who shares their page with the group does not receive a notification. Feedback notifications: Select from the drop-down menu who shall be notified when feedback is placed on a page or artefacts. In addition to the group settings that a regular user has, institution staff and administrators have a few more options. Controlled: Create a controlled group if you wish to add users who cannot leave the group. This is a useful setting for course groups where you do not want members to leave. Roles: Choose whether you have only members and administrators or also tutors. The latter can provide feedback and release pages when page submissions are allowed, but they cannot change group settings. Hide group: Switch this option to “Yes” if you do not want to list this group on the Find groups page. When you have site administrator rights, you have yet another setting when you create a group: Auto-add users. When you switch this setting to “Yes”, new users to the site are added to the group automatically. This is a great option when you want to set up a group which all users should join in order to participate in forum discussions. On mahara.org this is used to make every user a member of the “Community” group in which discussions around Mahara take place. You are then taken to the same screen as if you were creating a group and make the necessary changes. Group short names can be from 2 to 255 characters in length and contain only alphanumeric characters, “.”, “-“, and “_”. Group homepage URL: If the site administrator activated clean URLs, your group (homepage) has a human-readable URL which you can change to a certain extend. Choose the name for your group (homepage) if you do not like the default one. It must be 3-30 characters long. You can only use lowercase letters from a-z, numbers and - (hyphen). 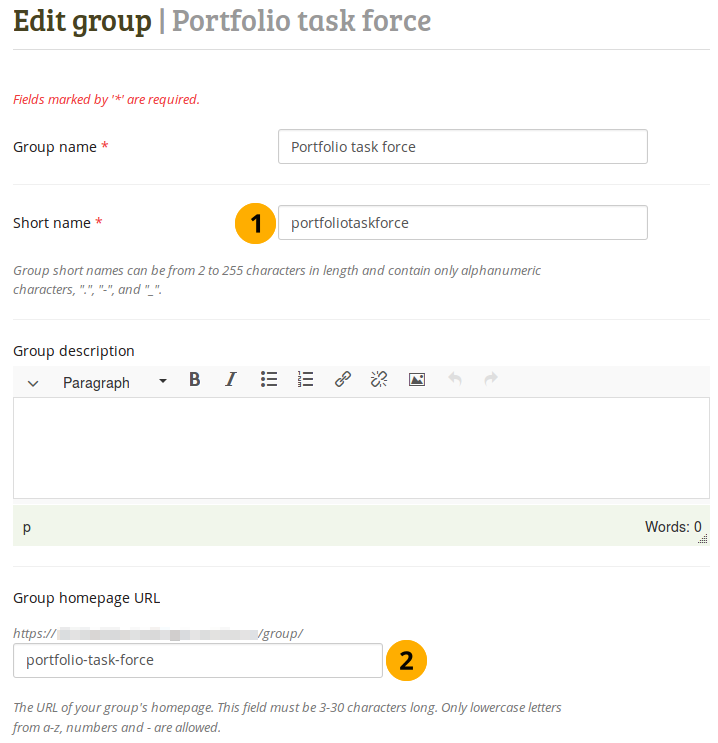 Your group will then be available via a URL like http://sitename/group/name-of-the-group, for example: http://mahara-university.org/group/portfolio-task-force. Though you can change the URL to your group at any point, you should not do that because people who already know the URL to your group will not be able to access it anymore after you have changed it. The original, internal Mahara URL such as http://mahara-university.org/group/view.php?id=456 will still work.